Today is the birthday of the Romanian sculptor Constantin Brancusi (1856-1957). 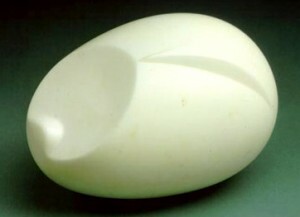 Below is one of his pieces, "The Newborn," part of the collection of the Philadelphia Museum of Art in Phildelphia, Pa.
Brancusi was one of the pioneers of modern art. He moved to Paris in 1904, where his reputation was built on his increasingly abstract sculptures. The Newborn, 8 1/2 by 6 inches, was created out of white marble in 1915. It could be a baby, an embryo, or a seed, but "The Newborn" is all about beginnings. Brancusi was originally trained as a stonemason and carpenter. One of his strongest influences in Paris was African art.